You may remember John Danaher as that weird genius at Renzo Gracie’s academy that likes to rip people’s legs apart. To that end, he decided, not that long ago, to release a DVD on some of the most devastating techniques that are used to attack the legs. The BJJ world had a seizure when the DVD came out as John Danaher is a legend in BJJ. But did you know that even though he is a specialist in leg attacks – he also knows a lot about all the other aspects of BJJ? It’s easy to miss out on this detail. To that end, soon, John Danaher will release a comprehensive set of DVDs headlined as the Back Attacks System. As the name suggests, it will deal primarily with the back attacks aspect of BJJ. Read more about Back Attacks Enter The System by John Danaher. Taking the back is one of the most powerful things that you can do in BJJ. It’s a position when you have a very high degree of control over your opponent and he is almost powerless to do anything about it. And the reason why this position is so powerful is that you have two points of control over your opponent. You get one point by using the seatbelt to neutralize the movements of his upper body and you get the other point by putting your hooks on the inside of your opponent’s thighs – neutralizing his legs. But first and foremost, you will need to get into this position. And this will not be as easy as it may seem. 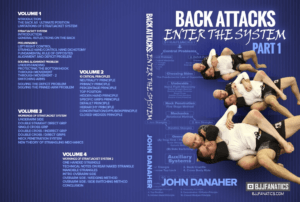 Luckily, John Danaher’s Back Attacks System DVD will give you loads of different methods and details about how you can enter the back position safely and effectively. Namely, there are many entries that you can use to get to your opponent’s back. You can do it from side-control, from closed guard, from the mount, and other ways. Arguably the most widely used back-take method is when the opponent is in the so-called turtle position. There are several different moves that you could use for submitting your opponent once you have taken his back. Arguably the most important and most effective of them is the classic rear naked choke. There have been many instructions on how to perform this choke successfully – some of them effective and some others not as much. What you need to do – and what Danaher will teach you – is that you need to block the two carotid arteries of your opponent. If you do this, then the blood flow to his brain will cease and he will go to sleep. But of course, this may seem like material for BJJ novices – especially if you already have had some experience in BJJ by now. But where Danaher specializes is in giving you small details that can make a profound influence on the execution of various BJJ moves. And the fact is that it’s not that easy to set up and execute the rear naked choke on an unwilling opponent. The fact is that he will try his best to give you hell before you submit him – as he usually has two free arms to fight off one of your arms. What Danaher will teach you is exactly how you can go about setting up the rear naked choke in the most effective way possible. Again, many of you know John Danaher as one of the leading specialists in leg locks. And this is what made the Renzo Gracie academy famous all over the world – the exploits of the leg-destroying Danaher Death Squad. Previously, the leg locks were looked at as something of more-or-less trivial importance for BJJ. They were even scoffed at in many BJJ schools. What John Danaher did was revolutionize this entire important part of BJJ. Nowadays the leg attacks are some of the most widely used BJJ techniques and this is in big part due to John Danaher’s teachings. Well, now he is about to do something very similar to the back attacks. This is a system for a position that can give you absolute control – if you learn how to play it right. So, it’s really no surprise that John Danaher has decided to specialize in this area and put out an instructional DVD. You will get a very comprehensive DVD set. In it, for the first few DVDs, you won’t even see a single back attack technique. John will start by developing the most important concepts and paradigms when it comes to attacking from the back. This may seem uninteresting to you when you read it like that – but it’s anything but. John will setup the scene for you and you will first get to learn the most important back attacks concepts before you get to see the powerful techniques. And the fact is that this is not some isolated, unused system that’s supposed to work in theory. This system consists of highly effective back attacks concepts that have been proven to work on the mats, time and time again. Just look at some of the matches of the Danaher Death Squad and see how they deal with taking their opponent’s backs. You will then see a glimpse of the power that the Danaher back attacks system has. John Danaher’s straight jacket system is designed to glue your body to your opponent’s back. If you use the techniques properly, then you will make it impossible for your opponent to rotate his body. John likes to use the “under” grip (from the “over-under” grip) to grab the opponent’s hand. This will literally make him a lot more immobile in terms of rotating his upper body. John will also teach you how to use your arms to control your opponent even more so – and this is not something that you often see anyone doing on the mats. The diagonal back control is another concept developed by John Danaher. If you abide by it, then you will need to put your opposite leg from the side of the hand you control – as a hook between your opponent’s legs. This will mean that your opponent will be, for all practical BJJ purposes, disabled. And there are a lot more revolutionary concepts that will shake the world of BJJ up. We can’t wait to see what the John Danaher Back Attacks DVDs will bring forward to the table!